The City of San Luis Obispo, by its own acknowledgment, has a severe imbalance in the amount of available housing compared to local jobs. This shortage is getting worse each year. The proposed Avila Ranch housing units will keep the problem from getting worse. The San Luis Obispo County Council of Governments (SLOCOG), which represents all of the county’s governmental agencies, has affirmed the principle that residents deserve an opportunity to live near their work. SLOCOG has identified additional housing in San Luis Obispo as the single most important thing that can be done to achieve the City’s and County’s Sustainable Community and smart-growth objectives. The City’s own plans for smart growth call for housing to be built at this location. Will Avila Ranch provide more than housing? Avila Ranch will provide many benefits for the entire community to enjoy. Among the benefits will be numerous traffic improvements, new parks and additional fees and taxes to support public schools. Most notable will be the extension of Buckley Road from Vachell Lane to South Higuera. In addition, Avila Ranch will pay for new bike paths and bike lanes, some of which will connect to the Bob Jones Trail. At completion, Avila Ranch will contribute approximately $3.6 million for school construction funds to the San Luis Coastal Unified School District, $20 million in impact fees to the City of San Luis Obispo, and more than $3.75 million in property taxes per year to local schools and government. Avila Ranch has been carefully designed as a balanced, environmentally sustainable community that not only responds to the region’s critical need for more housing for those who work in San Luis Obispo, but also helps mitigate pre-existing traffic conditions and responds to the region’s needs and desires for more parks and other open-space amenities. How many homes are to be built and what will they sell for? Avila Ranch will create 720 residential homes ranging from stand-alone single-family homes to town homes, apartments and cottages. Avila Ranch is designed to address the severe shortage of workforce housing as identified by the Economic Vitality Corporation, a nonpartisan nonprofit agency. The majority of Avila Ranch homes will be affordable by design, meaning they will be smaller units on smaller lots with lower maintenance costs. The City of San Luis Obispo’s Housing Element encourages the construction of smaller units as a way of providing homes at or below the price range for workforce housing. Why can’t you build more homes for lower-income families? The ability to build more units that sell at below-market rates involves tradeoffs. More units for lower-income households (i.e., subsidized housing) could be built if funds being used to build the extension of Buckley Road could be diverted, or if other traffic improvements being funded by the Avila Ranch project weren’t also required. For every “more” there is a corresponding “less.” As currently designed, Avila Ranch exceeds the City’s requirements for housing that is affordable to lower-income households. Will Avila Ranch feature leading-edge “green” technology? All Avila Ranch homes will feature numerous leading-edge technologies that are friendly to both the environment and to household budgets. These features are one reason a San Luis Obispo City Planning Commissioner called Avila Ranch a “gold standard” for housing projects. Avila Ranch will be San Luis Obispo’s first Net Zero Energy Community. Each residential unit will be equipped with solar panels capable of delivering 100% of electrical energy demand, exceeding the city’s current 30% guideline. As a result of this and other energy efficiencies, residents’ energy costs will be minimal. Avila Ranch’s design exceeds the proposed 2019 California building codes by at least 10% to 15%. Each home will be equipped with high-efficiency Energy Star appliances and light fixtures. All units will have EPA WaterWise certified fixtures. As a result, water use is projected to be 35% below the City’s current residential usage. All garages will be pre-wired for EV Charging Stations, and there will be several EV Charging Stations throughout Avila Ranch’s common areas. Is residential zoning an allowable use of this land according to the Airport Land Use Plan? Absolutely. In December 2016, the Airport Land Use Commission formally determined that Avila Ranch “meets and exceeds” the requirements of the Airport Land Use Plan. The Commission determined that Avila Ranch’s plans for 720 homes is actually less than half the amount the 1,620 homes currently permitted by Airport Land Use Plan regulations. The Commission also noted that the neighborhood was specifically configured to accommodate existing and future safety zone designations, that the proposed project is not subject to any excessive airport noise, and that it included features and regulations that were “above and beyond” the Airport Land Use Plan requirements. How will this project affect traffic on South Higuera and Los Osos Valley Road? One expected benefit of Avila Ranch is that many of the project’s residents will be people already working in San Luis Obispo, people who already are driving into and out of the city every day on South Higuera and Los Osos Valley Road. In other words, Avila Ranch as home to approximately 1,650 people will not be generating entirely new traffic. And if Avila Ranch were developed as the County intended – as a business park – there could be more than 14,000 employees coming and going all day long, generating six times more traffic than Avila Ranch will generate. Won’t 720 homes generate a lot of traffic on Buckley? There will be some additional traffic, to be sure, but only an estimated 6%, according to the independent consultants who conducted the Environmental Impact Report. The consultants concluded that Avila Ranch, at full build out, will generate very few eastbound trips on Buckley, estimating only an additional 1% to current traffic at the Buckley-Broad intersection and only about 6% additional total daily traffic on Buckley. Can you make the project smaller? A smaller project would defeat several important goals, including affordability. Further, a smaller project would not result in a decrease in traffic or any other environmental impacts, according to the independent consultants who conducted the Environmental Impact Report. The larger number of units makes it possible to reduce the average unit size, thus making the homes more affordable by design. Avila Ranch homes, on average, will be considerably smaller and more affordable than new construction has typically produced in the city in recent years. No other project currently under consideration in the city produces as many units as Avila Ranch that are designed to sell at or below the market’s median prices. Avila Ranch has been carefully designed to produce what several city councils have said they wanted to see – more homes at more affordable prices, with the least possible impact on the environment. Will Avila Ranch provide any traffic improvements? Avila Ranch has committed to paying for numerous traffic improvements, notably to pay for extending Buckley Road directly through to South Higuera, rather than simply imposing added traffic demands on Vachell Lane. This is a long-anticipated improvement that will provide easier access to US 101, and will divert a substantial amount of traffic away from the Los Osos Valley Road freeway interchange. 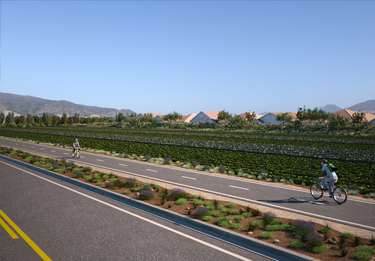 Additionally, Avila Ranch will provide new bike paths including the long-awaited direct connection of the Bob Jones Trail to the City’s bicycle system in south San Luis Obispo. What additional traffic improvements will be made? In addition to extending and widening Buckley, and in addition to building new bike paths and bike lanes connecting the City’s bike system to southern San Luis Obispo, Avila Ranch will fund improvements to ease traffic-flow problems all along South Higuera at the following intersections: Suburban, Tank Farm, Prado and South Street. All residents, not just Avila Ranch residents, will enjoy these improvements. Is there sufficient water supply? Yes. In fact, Avila Ranch homes will use less than half the water consumed for the current agricultural operations. Also, Avila Ranch homes will be using City water, and will not be tapping into existing groundwater supplies. Fortunately, because City officials have planned so well over the years to identify and secure water supplies, the City has surface water rights for approximately 12,100 acre-feet annually from Nacimiento, Salinas and Whale Rock reservoirs. City residents currently use about 40% of that allocation, or about 4,800 acre-feet annually. Even during the last year of the drought, the City was able to use as much water as needed from those surface water sources without relying on its groundwater resources or other reserves. Now, following the winter rains of 2016-17, the reservoirs are virtually full. The City’s water demand by the year 2035 is projected to be 7,500 acre-feet, approximately two-thirds of the current contracted supply. At full buildout, Avila Ranch’s consumption of potable water is projected to be a fraction – about 1% – of the unused portion of the City’s current allocation. Finally, Avila Ranch homes will use recycled water to the greatest degree possible and install the most efficient water fixtures. Will farmland be lost to this plan? The project will result in the conversion of about 90 acres of a current 150 acres. Neither the County – which zoned it for office uses – nor the City ever intended this land to be farmed long term. It’s a generally accepted planning principle that farming and agricultural uses belong outside of the Urban Reserve Line, not as a next door neighbor to houses and businesses as is currently the situation. If this land were not developed, residential and commercial growth would simply spill out and accelerate into other areas outside the current urban reserve line. While about 90 acres of farmland will be used for Avila Ranch, it will be replaced by protection of farmland of equal or greater quality elsewhere in the community.